Prime Minister Narendra Modi launched a scathing attack on the Congress in Imphal, Manipur, while addressing a rally ahead of Lok Sabha Elections 2019. Imphal: Prime Minister Narendra Modi on Sunday alleged that the Congress, through its manifesto, which he termed as ‘dhakosla patra’, is blowing the trumpet of Pakistan more than that of India. Addressing a Lok Sabha Elections 2019 rally in Manipur’s Imphal, he also attacked the party for ‘standing with those who want separate prime ministers for India and Jammu and Kashmir’. “Congress un logon ke sath khadi hai jo kehte hain ki Jammu and Kashmir mein do PM hone chahiye, ek Dilli mein, ek Jammu and Kashmir mein. Yahan tak ki Congress ka jo ‘dhakosla patra,’ hai vo Bharat ka kam, Pakistan ka bhopu zyada lagta hai (The Congress stands with those who want separate prime ministers for India and Jammu and Kashmir. The party is also helping in spreading propaganda of Pakistan across the world… Congress’ hypocrisy document seems to blow the trumpet of Pakistan more than that of India),” he said while noting that the Congress had claimed no one could tamper with Article 370 of the Constitution, an assertion which Pakistan agreed to. Article 370 grants special status to Jammu and Kashmir and limits Parliament’s power to make laws concerning the state. 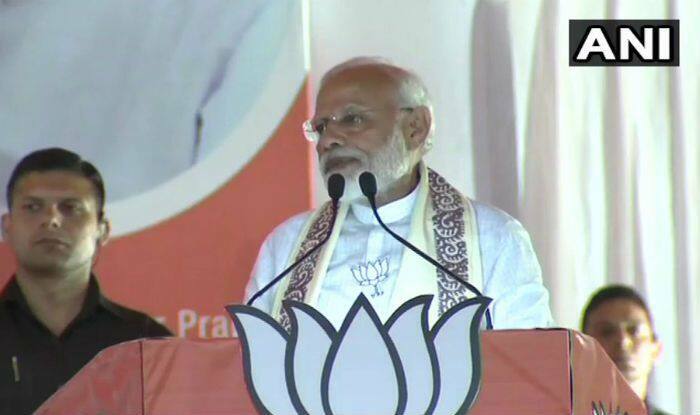 Earlier in the day, PM Modi while addressing a rally in West Bengal’s Cooch Behar had launched a scathing attack on West Bengal Chief Minister Mamata Banerjee by saying that ‘Didi’ is supporting people who want two PMs in India. “For vote bank politics, ‘Didi’ now stands with the people who want to break India. She is supporting people who want two PMs in India,” PM Modi said this in an apparent reference to National Conference (NC) leader Omar Abdullah‘s recent statement wherein he had advocated a separate prime minister for Jammu and Kashmir. Lok Sabha Elections 2019 are scheduled to be held in seven phases on April 11. The polling for the two Lok Sabha seats in Manipur will be held on April 11 and April 18. The counting of votes will be conducted on May 23.